Just a reminder that Memorial Day was not created so that everyone can shop and the folks who work at the banks get another day off. It was not created so that we could barbecue and open up the swimming pools, although you would never guess that by all the sales and what we observe in our culture. We need to use this time to remind ourselves of what is really important and of the values that made our country great. 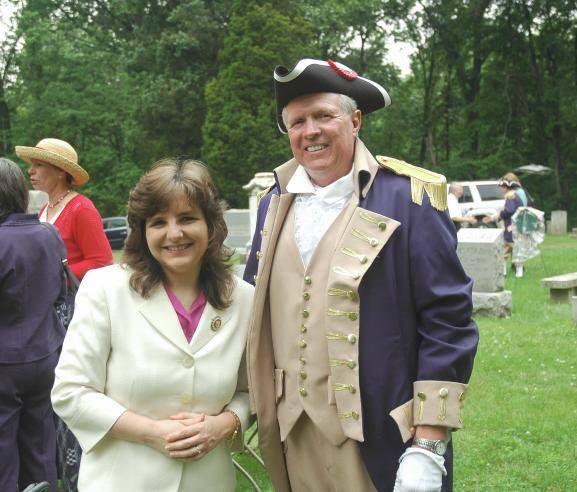 A few years ago I was invited to speak at an event put on by the Daughters of the American Revolution to honor our past heroes of Liberty. 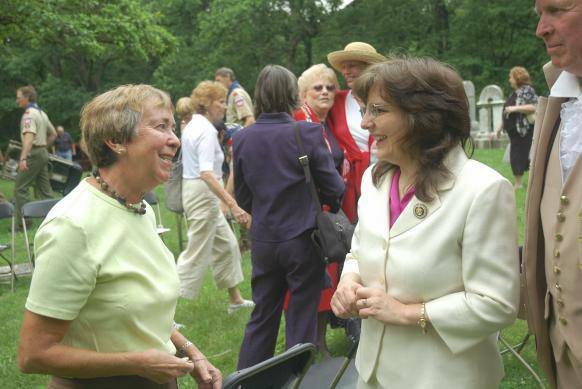 There is no place more fitting to talk about those we want to remember than a cemetery. 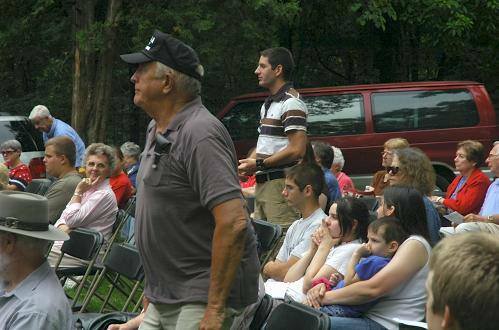 John White, a member of the St. Charles County Council, and I. This is the part of the ceremony that grips all of us….when they asked those who are members of the military to stand up and be recognized. The young man standing in the center is my son, Ben, who was with the Missouri Air National Guard 131st Fighter Wing and now Alaska Air National Guard. We had six of our children with us that day and five of them are pictured including their big brother, Ben. Visiting with some of the Daughters of the American Revolution. Love all those who are helping to remind us of history. It is only due to the courage of those who fought for us, and to God’s providence, that we are where we are today. 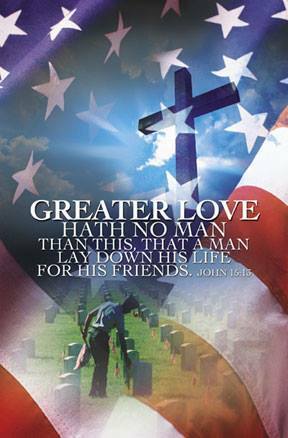 It is proper for all of us to take the time to remember those who gave the ultimate sacrifice for our freedom and liberty. This is one of my favorite videos because it gives us a small glimpse of the struggles others have endured for us and the importance of prayer. 1.) 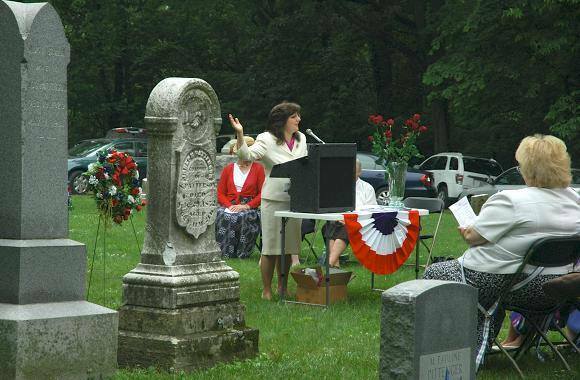 Attend a Memorial Day Ceremony in your area. 2.) Help us spread the facts to others who need to hear. Any contribution will be used to help further our research to inform others. You can mail a check to Cynthia Davis, 1008 Highway K, O’Fallon, MO 63366. There were over 16 million World War II Veterans. Today only a little over one million are still with us. On this special Memorial Day episode of Home Front, I interview a veteran of both World War II and the Korean War. 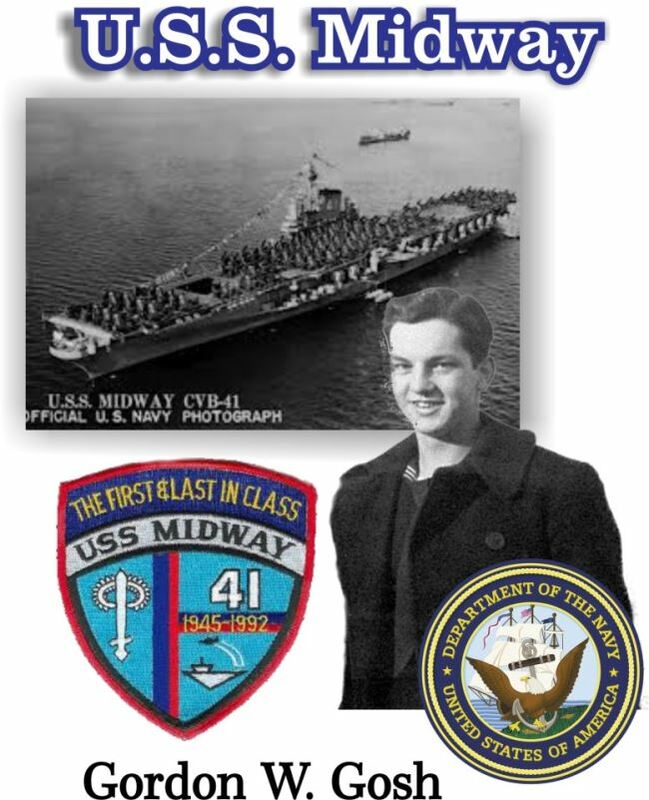 Gordon Gosh was stationed on the USS Helena (Heavy Cruiser) and on the USS Midway (Air Craft Carrier). He tells us stories of what it was like to be in the Navy back then and what we should know about how to treat our military today. We should win quickly and get out. of their choice, not just a government run hospital. Cynthia, you are dealing with the symptoms of the problem and failing to dig at the root of the problem. All wars are “bankster” wars. You need to read General Smedley Butler’s book, “War is a Racket.” You also must realize that our foreign policy is under the control of the international banking cartel which owns the private non-federal reserve system, and AIPAC and the bandit state of Israel. You must also realize that these people own/control all major media in the USA including, but not limited to Fox news and they incessantly bombard the unwitting public with their propaganda. In your article, you say our troops are put in harms way facing people “…who hate us…”. Cynthia, why do they hate us? Would you not hate people who senselessly invade your country and make war against you without any justifiable cause as is being done using American troops as cannon fodder? If it were not for our antichrist Edomite adversaries identified in Revelation 2:9 & 3:9 who call themselves “Jews” and “Israelis” and occupy the land fallaciously called “Israel” that was stolen from its rightful heirs, the Palestinians, the descendants of Ishmael, the son of Abraham by Hagar, the hand maiden of Sarah, Abraham’s wife, there would be no American aggression in the middle east or any need for it. Who hates who and why? According to the bible, Malachi 1 & Romans 9, our Creator/Savior loves us, the descendants of Jacob/Israel (now known as “Caucasian Christians” in our respective “multitude of nations” we have become of which the USA is but one), but hates Esau/Edom and his descendants, who hate us and are trying to steal back the birthright given to our forefathers Abraham, Isaac, & Jacob/Israel. In other words, our Creator/Savior is using our antichrist Edomite adversaries as “thorns in our sides” pursuant to Judges 2:1-3 to inflict His chastisement upon us pursuant to Deuteronomy 28:15-68 because we, as His covenant people, have turned away from Him and His social, political, economic, environmental system and moral code and allowed the humans we elect/appoint to run our corporate fiction creature government image to render our Creator/Savior’s laws of no effect. Instead of seeing to it that our Creator/Savior’s Will/Law is done in our respective lands as it is in heaven as we are told to do in Matthew 6, we are practicing “Baal worship” of our own corporate fiction creature government image and allowing it to be as our “god” or “gods” while giving lip service to our Creator/Savior in some social club erroneously called a “church” a few days a week. This in flagrant violation of the first three commandments. 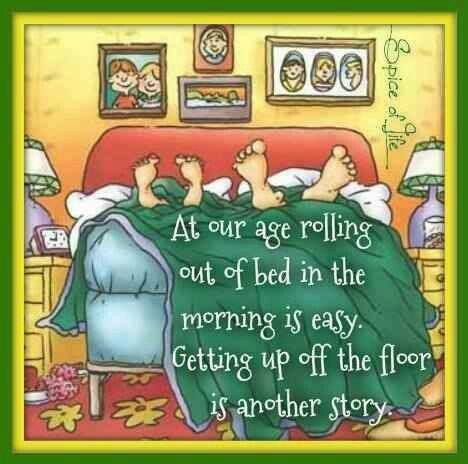 To put the icing on the cake, we have adulterated the Sabbath in violation of the 4th commandment. (See Matthew 7:21-23 & 15:7-9). Yes Cynthia, something is terribly wrong in America. The problem is, most professing Christian Americans do not even know who they are, and due to false doctrines of men which “tickle their ears” and make them feel self-righteous, they fail to realize that it is they themselves who are squarely to blame for the iniquity, and not “Satan” (our antichrist Edomite adversaries) or the “devil” (false accusers/slanderers). They are merely our Creator/Savior’s “…vessels of wrath fitted for destruction” (Romans 9) whom our Creator/Savior is using to chastise us. Always enjoy/appreciate your notes. I have noticed a distinct change in the tone of congressional critters since Ryan took over. You could always count on Jim Jordan, Ohio to speak out or the gentleman from Georgia, or Peter King of Iowa. Now you either don’t even hear them or they talk like Milquetoast. And Mr. Ryan is more concerned about accommodating Obama and and his policies but can’t bring himself in endorsing the Republican nominee. If you don’t agree with Trump come out and say it. I wish I could understand this alternate universe. Off course, you will get elected and when you do I look forward being able to talk to someone that speaks the language of us common folks. Thanks, Cynthia, for that great letter. Wish I lived in your district so I could vote for you! Thanks. I wish you lived in my district also. Glad you like my newsletter.